There are few places as insanely naturally photogenic after the rain (or during) as Radiator Springs. All the neon reflecting off the ground provides a saturated glow of wonderful color, and the splendor of the setting really brings a sense of nostalgic romance. It's normally rare enough to get rain in Southern California (this winter season excepted). So it's a great delight to be able to capture scenes such as this. 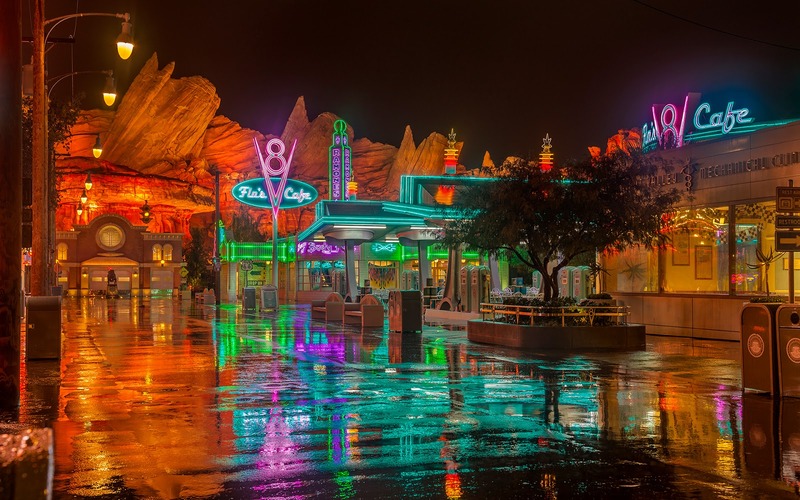 The glistening reflections of Radiator Springs after an evening drizzle create a magical scene.